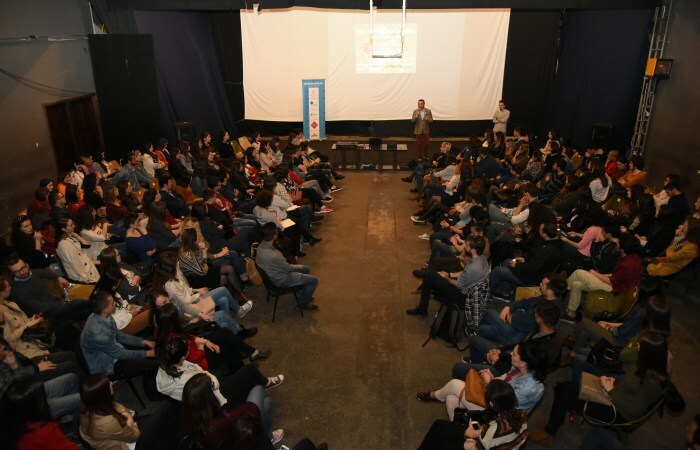 Aiming to inspire the audiences towards creating a bigger impact using the written arts, the #42nd Edition of BarCamp Prishtina brought in front of the audience some of the most talked about writers and speakers in the recent times. A total of 128 participants heard the stories of these writers and how their art work has impacted the community in which they contribute. The event was held at the ODA Theatre on the 22nd of March 2017, starting from 18:00. With backgrounds in television, novels and education, the speakers brought an array of different experiences in the field of writing and creating wide social impact. These speakers were Adriatik Kelmendi, Sibel Halimi and Albatros Rexhaj. Adriatik Kelmendi was first to lead off the BarCamp Edition, with a practical exercise which demonstrated the way information changes and gets added to it from person to person that it becomes almost unrecognizable towards the end. Adriatik also shared some of the highlights of his career, explaining that his first article to be published talked about Curt Cobain’s death, and he subsequently bought all the magazines in the kiosk to share them with his friends. According to Adriatik, today, even though it is easier to write and publish, the responsibility remains the same with each writer and what they write about. Another opinion of Adriatik was that not everything that is written is art and worthy to be read. Sibel Halimi started her speech with a poetry she had recently written about the national day of poetry. She continued to say that major changes can come to the community from something simple like a social media account and good writing. For each writer, according to Sibel, it is important to ask themselves the question “who are we writing for, and what do we want to convey”? One of Sibel’s main aims with her writing and work is to inspire gender balance and feminism. “If one is to love freedom, one is to also not judge another for what they write, only hold them responsible for the concrete impact those writings have on the community”. Albatros Rexhaj encouraged the audience to first spend time developing their writing skills, in order to produce quality artistic writing and start affecting the community. Often times, according to Albatros, our writings are not perceived the way we want them to, and that is not the reader’s error, but ours. In these cases we need to be able to write more concisely and provide the reader a better insight into our minds through our writing. On the emotional side of his speech, Albatros shared his opinion that “you may be able to move mountains, but you are not able to make someone fall in love with you.” Albatros’ speech was widely based on accepting yourself and staying true to yourself before accommodating the desires and liking of others. For, at the end of the day, we each have a little time alone with ourselves, and if we do not have reason to love ourselves in those few minutes, then we are wasting our life. “By trying to be correct with the world, we often times are not correct with ourselves”, said Albatros. The event was followed with high interest, and the audience had many questions to ask the speakers which helped create a diverse discussion.